Held on one of the best floors in Charlotte, this bi-monthly drop-in event presents varied cultural themes. Mint to Move is not just a dance party, but rather an artistic and cultural experience paying tribute to artists and Latin, African, & Caribbean countries. Our traditional Día de las Velitas (Day of the Candles) starts at 7:00 PM with special guests Café Amaretto, a CommUNITY time of friends, Unity, and cultural desserts. Free admission between 6:45 – 7:30 PM, and you can stay for Mint to Move! Mint to Move brings back the fantastic Orquesta Mayor featuring music from different genres including, but not limited to, salsa, cumbia, merengue, bachata, bolero, etc. Also with us, DJ Carlos LeBron, with over 15 years of DJ experience, DJ Carlos LeBron is famous for his NY style mixing skills which led him to be the only Latin DJ to perform at the DNC media parties in Charlotte. 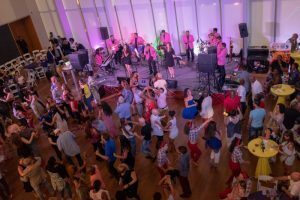 Adults enjoy 4 hours of Afro-House, Afro-Cuban, and Latin American dance rhythms with a DJ, live musicians, and unique themes to celebrate multi-cultures, ethnic and gender diversity, dance, visual and performing art. Guests can semba, salsa, bachata, cha cha, line dance, and step to other dance forms relative to various global communities as well as enjoy other performing and visual art. Free dance lessons at 7:45 and 9 PM with Rumbao Dance Company. Ballroom, salsa, and other dance programs are welcome. Complimentary snacks and party favors are offered while they last, along with a cash bar.